Changing the color of your hair is a fun and a relatively simple way to change your look dramatically. Women have been coloring their hair for hundreds of years, and for centuries they’ve been struggling with how to remove the dye from their skin afterward. Modern hair dye is extremely useful at coloring your hair, which also means that the skin on your hands and around your hairline might suffer the same fate, especially when you dye your hair at home. Learn how to get hair dye off skin with these tips and tricks. Many people choose to DIY their hair color at home because it is less expensive and more convenient than heading to the salon. Unfortunately, when you dye your hair at home, you can often run into the issue of hair color stains on your skin. If you end up getting hair coloring on your hands, face, or neck, here are some ways you can remove hair dye from skin. Unfortunately, hair dye has a habit of staining the skin on your hands and along your hairline. This can happen even if you take the proper precautions. Luckily, there are a few everyday, household products that can safely and effectively remove hair dye from skin. Here are the best ways for how to get hair dye off hands, face, and neck. Pour about one teaspoon of liquid laundry detergent into the palm of your hand. Use your fingers to rub the soap into the hair dye stain. Be sure to use a detergent that is free of fragrances and dye and keep it away from your eyes. Take a clean cloth and soak it in warm water, and rub the water directly onto the stained skin. Gently scrub the hair dye stains until the color starts to fade. Repeat the process as needed until the stains disappear. Baking soda is mildly abrasive and extremely effective at removing hair dye. It will help to scrub off dead skin cells that are stained with dye while attracting the dye molecules and lifting them from the skin. Mix two teaspoons baking soda with two teaspoons liquid dish soap, stirring well to combine. Use a cotton pad or cotton ball to scrub the baking soda solution onto the stain. Scrub the mixture over the dye using a circular motion and gentle pressure. Rinse the entire area with water until all the baking soda mixture is removed. Toothpaste isn’t only for removing stains from your teeth, but can also be useful in removing hair dye from your skin. Use your fingers to apply a small drop of toothpaste to the hair color stain. Spread the toothpaste across the entire stain to create a thin layer over the stained skin. Gently rub the toothpaste into the dye for at least 30 seconds. After scrubbing the area, rinse the toothpaste off with lukewarm water. Repeat the process if needed. Dying your hair doesn’t mean you have to live with the resulting staining. 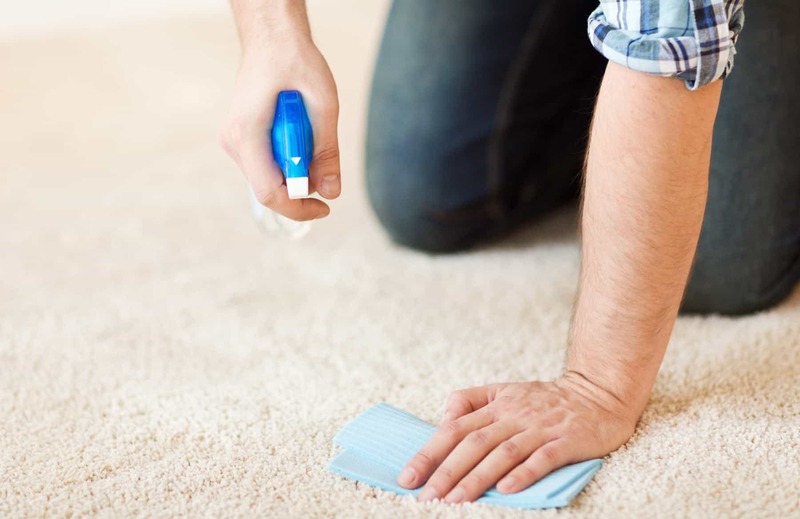 You can quickly remove the stain with the help of a little bit of petroleum jelly. Just dab a bit of petroleum jelly onto the stain, and massage it into your skin using a circular motion. Continue to scrub the affected area until you notice the stain disappearing. Use a wet, clean rag to wipe the petroleum jelly off your skin. If some hair dye remains, reapply some petroleum jelly and let it sit on the stain overnight. The next morning, wipe the residue away with a clean, wet rag. Use your fingers to apply a generous coating of baby oil to the stained area. Make sure you apply enough of the baby oil to coat the stained skin, but not so much that it drips over other areas. Let the baby oil sit on your skin for at least eight hours. To avoid the oil soaking into your sheets or pillow, cover the affected surface with clean cotton bandages. The next morning, rinse the baby oil off your skin using warm water. Take a cotton ball and soak it with nail polish remover. Remove the excess liquid by gently squeezing the cotton ball between your fingers. If your skin is sensitive, you will want to skip this method. Rub the cotton ball over the affected area several times using a circular motion. Thoroughly rinse the area with cold water to remove any residue. You can remove hair dye from your face and neck using a face cleanser or regular soap. Just wash your face or hands as you usually would remove hair dye stains from your skin. Be careful not to over-scrub your skin to avoid irritation. 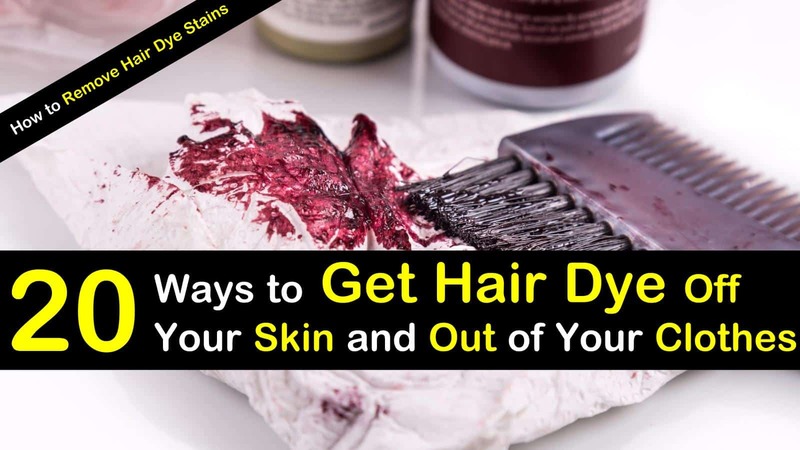 If the dye doesn’t come off after two to three washings, then you should try one of the other effective methods to remove hair dye stains from your skin. Body scrubs contain exfoliating agents that are designed to remove dead skin cells, making them and an effective hair color remover. Apply a drop of the body scrub onto your skin and gently scrub the area to get the hair dye off. If you don’t have a body scrub at home, you can make your own. Mix the oatmeal and sugar. Add a little bit of warm water and the essential oils. Stir to combine. Rub the homemade body scrub onto your skin. Rinse with warm water. WD-40 has earned the reputation of a product that can fix everything. While it is not recommended that you use this product on your face or neck, you can safely remove the hair dye from your hands with a few squirts of WD-40. Just spray a little WD-40 on your hands, rub them together and voila! There shouldn’t be any more hair dye stains on your hands. When using hairspray for hair dye removal, it is essential to use it with caution as it won’t be the right solution for every skin type. If you are trying to remove stains from your hands, spray some hairspray into the palms of your hands and vigorously rub the area, then rinse with water. If you are trying to remove hair dye from around your hairline or neck, spray hairspray onto a cotton ball and blot the affected area. This should effectively lift the stain from your skin. Lava soap is a heavy-duty cleaner that is used to remove engine grease, paint, grime, and tar from hands. This means that it should only be used to remove hair dye from your hands. Create a thick lather on your hands and vigorously scrub at the stains. Then rinse with warm water. Olive oil can be extremely effective at removing hair dye because it can break up the color and is gentle on your skin. Apply the olive oil to the affected area on your skin, gently massaging it into the surface. Allow the olive oil to sit for at least eight hours before rinsing it with warm water. To remove all the oil from your skin, apply a bit of shampoo to the area to remove the oil from your skin. Makeup remover in an inexpensive way to get hair dye off the skin. Not only can it be used to clean makeup brushes, but it works very well to get hair dye stains off your skin. You can pick up a bottle of makeup remover from your local drug store, and it can help you tackle those unsightly stains on your skin. Apply a bit of the remover to a cotton ball and gently start to rub at the stain. Wait for five minutes before rinsing the product off with warm water. 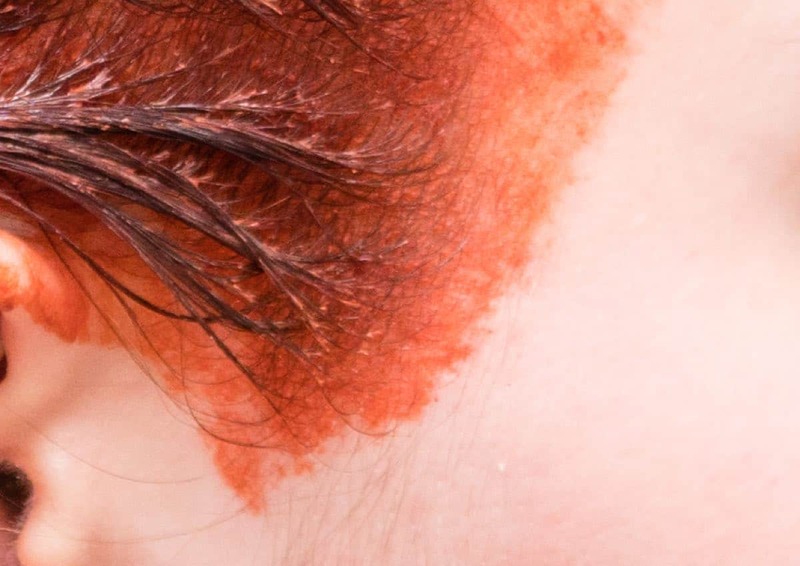 If you’ve decided to skip the salon and dye your hair at home, you can still utilize the professionals when it comes to removing hair dye stains from your skin. Many professionals will have an arsenal of tricks for removing hair dye from skin. Of course, you’ll have to pay for the service, but it will still cost you less than if you were to have the professionals dye your hair. You can effectively remove hair color from your face and hands with hydrogen peroxide. Using a cotton pad to apply two percent hydrogen peroxide to dried-on hair dye. The peroxide will work to lighten the color and remove it from your skin gradually. Using this technique isn’t without its risks, however. If you accidentally get any peroxide in your hair, it will also remove the dye from the shaft of the hair as well. If you find that the hair color stains on your hands are stubborn, you can use chlorine bleach to rid your skin of the dye. People who have sensitive skin shouldn’t use this method because bleach is a harsh chemical that could cause severe skin irritation. Use a cotton ball to apply the bleach to the stained skin, immediately rinsing it was warm water. To ensure you remove all the bleach, make sure to wash your hands with soap and water. Another easy way to tackle pesky hair color stains on your skin is by combining rubbing alcohol with some liquid hand soap. Wet a cotton ball with the soap and rubbing alcohol, then gently rub the cotton ball over the affected area. When done, rinse with water to remove any leftover residue. Another problem that you might run into by coloring your hair at home is the inevitable stains that appear on your clothes during the process. 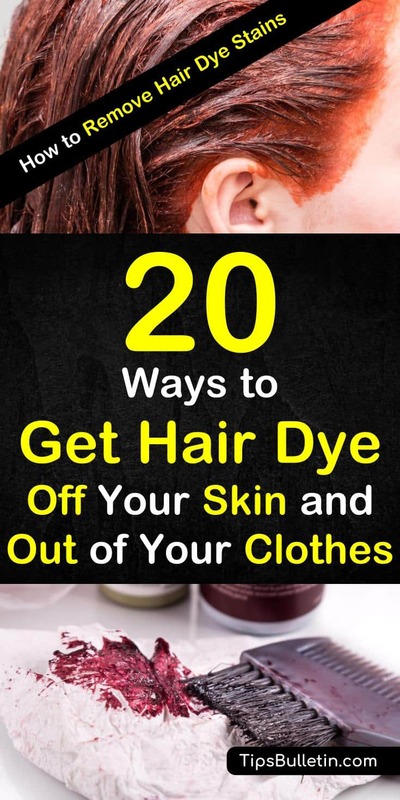 Luckily you can quickly remove hair dye from your clothes with a few common household ingredients. The first step is to act as soon as possible. Ammonia is a staple cleaning agent that can effectively remove hard stains from hair dye. Add ¼ cup of ammonia to four cups of water and submerged the affected area entirely. Allow the garment to soak in the cleaning solution for about 30 minutes. Remove the clothing and rinse it under running water. Launder the clothing as usual. Another favorite stain remover that will work on hair dye is rubbing alcohol. The isopropyl alcohol helps to remove the stain by reactivating the color in the hair color. 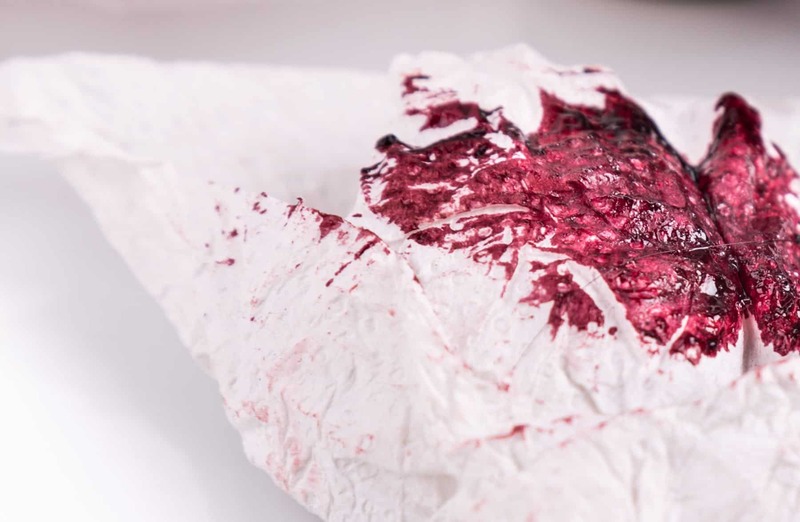 Place a paper towel under the area stained with hair color. Pour enough rubbing alcohol over the stain so that it is thoroughly wet. Wait for one minute, then use a folded paper towel to blot the stain. Next, place the garment in a large bowl and pour a generous amount of rubbing alcohol over the stain. Let it soak overnight. The following day, rinse the stained area under running water. Wash as usual. Repeat the process until the stain has lightened. Hair dye is one of the more problematic stains to get out of the carpet. However, with the right ingredients and technique, it is possible. In a large bowl combine two cups warm water, one tablespoon of dishwashing liquid, and one tablespoon of white distilled vinegar. Mix the ingredients thoroughly to combine. Dip a clean cloth into the mixture. Wring the fabric out to remove excess liquid and avoid oversaturating the carpet. Gently blot the stain with the fabric. Avoid rubbing the towel into the stain as it could end up embedding the dye further into the carpet fibers. In addition, mix the mixture in a spray bottle to spray over the area. Grab another clean, dry cloth and continue to blot at the stain. Blotting the stain should help the fabric soak up some of the dye that was loosened by the cleaning solution. Sponge the area with water and use another dry cloth to blot the affected area. Once you effectively remove the dye, dab the area with a sponge dampened with clean water, being sure to wet the entire area. Then, use a dry cloth to blot the area and draw the water out of the carpet. If you’re rethinking those bright blue streaks that you’ve put in your hair, you don’t have to cringe every time you look in a mirror. If you used permanent or semi-permanent hair dye you could effectively remove it, or at the very least lighten the color effect, with a bit of baking soda. Using baking soda on your tresses can help to strip the color from your hair. It will completely remove temporary and semi-permanent hair dye with the first attempt. If you are trying to remove permanent hair color, it may take several attempts. Start by wetting your hair with the hottest water you can handle. Put a bit of anti-dandruff shampoo in the palm of your hand, then sprinkle an equal amount of baking soda over the shampoo. Blend the products and smooth the mixture through your hair, then rinse. Repeat the process as many times as need to remove the hair dye. Coloring your hair color at home can save you a ton of money and time, and now you don’t have to worry about those unsightly hair dye stains on your skin. These simple tips and tricks will let you continue to color your hair without having to worry about the dye staining your face, neck, and hands. We hope you enjoyed learning how to get hair dye off skin and out of your clothes and carpet. If you found these tips and tricks to be useful, please don’t hesitate to share the information with your friends and family.